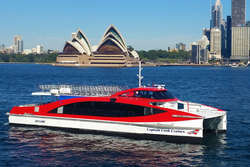 The easy way to purchase your multi-trip ferry tickets for travel between ICC Sydney and the City. Download the app to your phone, select your eTravelPass and jump aboard! 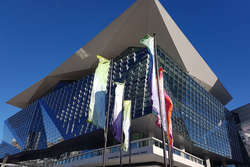 ICC Sydney (International Convention Centre), restaurants, pubs, Harbourside Shopping Centre, Australian Maritime Museum, Chinese Gardens, hotels, light rail and parking stations. 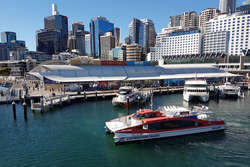 Sydney Opera House, Circular Quay Transport hub including Airport train line, The Rocks historic precinct, restaurants, pubs, hotels, Harbour Bridge walkway, pylon, Bridge Climb, cruise & ferry wharves. Ferries do not operate Christmas Day. 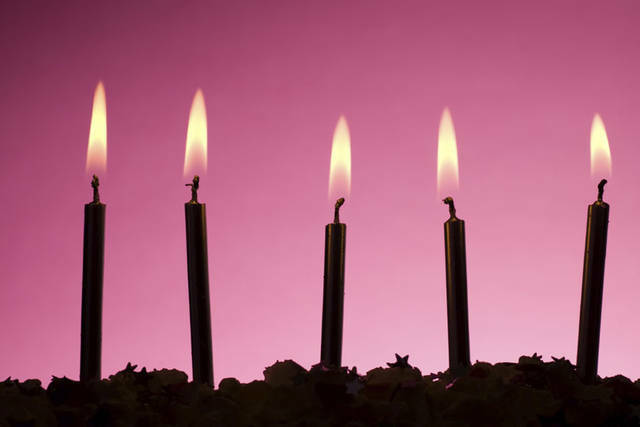 Special or limited timetables operate on 26 & 31 December, 26 January and selected special events. GOLD DINNER - An absolute must do. 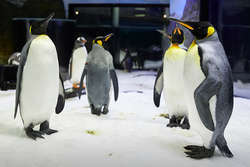 Attentive staff with a lovely attitude, delightful food and wonderful entertainment. 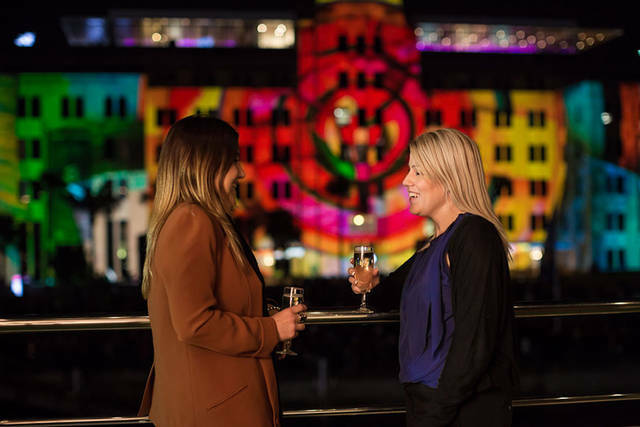 The easiest way to travel between Sydney's newest waterside suburb Barangaroo, and Pier 26, ICC Sydney, Manly, Circular Quay, Watsons Bay and Luna Park, plus White Bay on selected dates. Skip the traffic and choose harbour views instead. 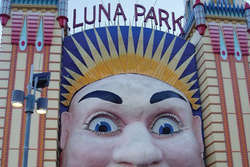 Luna Park is just for fun. The smiling face at the entrance of this restored fun park has welcomed millions of visitors since 1935. 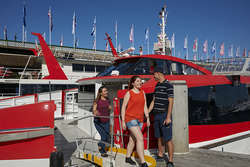 For a limited time, purchase your unlimited ride pass with Captain Cook Cruises and receive a free return rocket ferry to Luna Park from Circular Quay or Darling Harbour. "Seven miles from Sydney and a thousand miles from care". 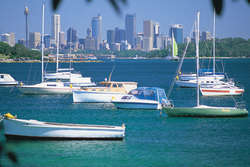 Manly is a must when visiting Sydney with plenty to do and see - restaurants, bars, shopping and beaches. Manly has it all and what better way to get to and from Manly than by ferry. 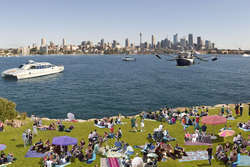 The White Bay Ferry operates between White Bay Cruise Terminal and Barangaroo (King St Wharf No.2), offering fast and easy access to the heart of Sydney City. The new Wynyard Walk provides world-class, pedestrian access from Wynyard Station transport hub to King Street Wharf and adjacent Barangaroo. 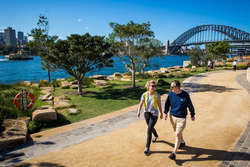 The short 6-minute Wynyard Walk provides access to the waterfront, avoiding steep inclines and road crossings for people with a disability, the elderly and people with strollers and luggage. 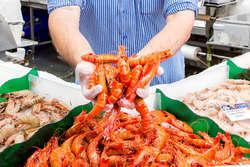 The Sydney Fish Market is the largest of its kind in the Southern Hemisphere and the third largest seafood market in terms of variety in the world. The market sources product both nationally and internationally and trades over 13,500 tonnes of seafood annually with up to one hundred sustainable seafood species traded every day and approximately 500 species traded annually. Outlets are open until 4.00pm or 5.00pm and include a gourmet deli, six seafood retailers, sushi bar, gift shop, plus restaurants open until 11.00pm nightly. 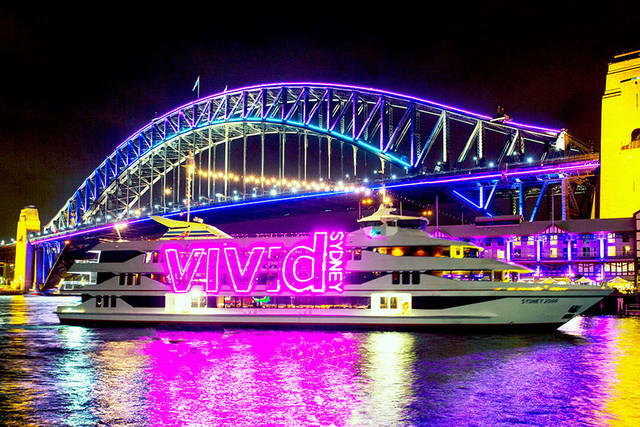 The easiest way to purchase your multi-trip ferry tickets with Captain Cook Cruises Sydney. Download the eTravelPass app onto your mobile for access to a range of passes on our most popular ferry routes, valid for up to 365 days. If paying by PayPal no credit card fees apply however the customer’s PayPal account is securely encrypted and saved to the customer’s SeaLink account. The next time the customer wishes to purchase another pass using PayPal, their details will be saved so the customer does not need to log-in to their PayPal account. OpalPay is a convenient new way to pay for travel using your Opal card on participating privately operated transport services. Where can I use OpalPay? 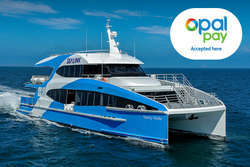 You can now tap to pay with your Opal card on selected private ferry services. Look for 'OpalPay accepted here' signs. With OpalPay, you can use your Opal card on a wider range of transport services, allowing you to travel to more places more easily. There’s no need to buy individual trip tickets, you can just tap to pay with your Opal card for a more convenient way of paying your fare. How much is an OpalPay fare? OpalPay fares are not the same as standard Opal fares. Fares are set by the private transport operators. Concession fares are only available on selected routes and it’s best to check with staff before pay with your Opal card, as you could be charged the full adult fare. Can I travel if I do not have enough money on my Opal card? No. Your Opal card must have sufficient funds to cover the full cost of the fare when using OpalPay. If you have set auto top up on your Opal card, this will be activated at the payment device if the amount on the card plus the auto top up value is enough to cover the transaction. If the two values are not enough, the transaction will be declined and the auto top up will not be processed. Set auto top up, top up online or at an Opal top up and ticket machine. Check opal.com.au for all the options. Which Opal cards can be used with OpalPay? Concession fares are only available on selected routes and you may be charged the full adult fare, even when Gold Senior/Pensioner or Concession Opal cards are used. Check with staff to find out if concession fares are available. Which Opal cards can’t be used with OpalPay? Can I check in advance if OpalPay is available on a service? OpalPay available will be displayed on services where you can use your Opal card with OpalPay. How do I use OpalPay? To pay for your travel using OpalPay, make sure you have sufficient funds on your Opal card to cover the full price of your fare and simply tap to pay on the operator’s payment device. Do not tap on an Opal card reader. OpalPay fares are deducted from your Opal card when you tap on, so you won’t need to tap off at the end of your trip (see ‘Which Opal cards can be used with OpalPay?’ to check if your Opal card is compatible). Can I travel if my Opal card balance is low? Check your Opal card balance and the operator’s fare before you travel to make sure you have sufficient funds on your Opal card to cover the trip. Will tapping on with OpalPay contribute to my Opal travel benefits? No. 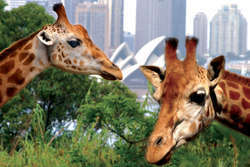 Unlike trips made with Opal cards on other public transport services, OpalPay trips do not contribute to Opal travel benefits or discounts (Opal travel benefits and discounts include Daily Travel Rewards, Weekly Travel Rewards, Opal Transfer Discounts, Opal Travel Caps and Opal trip advantage). $2.60 Sunday Travel Cap for Adult, Child/Youth and Concession Opal card holders. $2.50 Daily Cap for Gold/Senior Pensioner Opal card holders. Can two people travel together using the same Opal card? No, each customer over the age of four must have their own Opal card to travel. What if my Opal card is lost or stolen? If your card is registered and it's lost or stolen you can report on opal.com.au. Your existing balance can be protected and you can get it transferred to a new Opal card and sent to you. How will I know how much value is left on my Opal card? You can check your balance on your Opal account online or at an Opal top up and ticket machine. How do I check my transaction history? You can check your transactions via your Opal activity statement. What happens if I forget to tap on or tap off with OpalPay? With OpalPay, you tap to pay with your Opal card on the operator’s payment device, not an Opal card reader. You won’t need to tap off at the end of your trip. Can a tap on be reversed? OpalPay reversals can be made directly on the operator’s OpalPay payment device. After you have tapped to pay, staff can reverse the transaction. 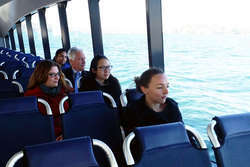 The private ferry fare must be the last recorded action on your Opal card. If you tap on an Opal card reader by mistake, you may be able to reverse it. If possible, you can go back to the Opal reader. To reverse the tap on, you just present your card a second time to the Opal reader within 30 minutes of the original tap on. Alternatively, please use the nearest Sydney Ferries service, if available. Is there a maximum fare with OpalPay? Maximum transaction limits apply for each operator. $25 per transaction, $30 per day and $200 per week. 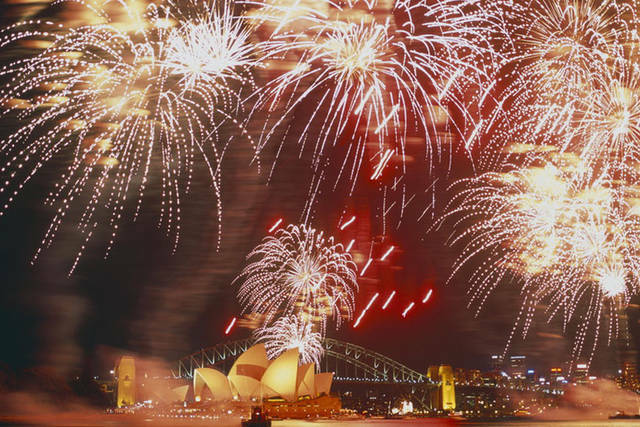 Get the best seats to a spectacular Sydney Harbour New Years Eve. Fireworks cruises selling fast!